Sean Terry made a debut half-century as Northamptonshire earned a productive morning against Sussex at Arundel in the Specsavers County Championship. The 24-year-old former Hampshire batsman, who has joined the county on a non-contract basis, made 54 in a fourth wicket stand of 119 in 27.3 overs with Rob Keogh, who had 73 not out at lunch on the third day in a total of 276 for 4. 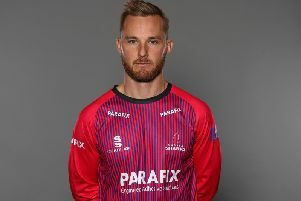 Ollie Robinson had earlier removed Alex Wakely without addition to his overnight 46 with his first ball of the day when the Northants’ skipper was drawn forward and edged to wicketkeeper Ben Brown. But Keogh and Terry batted with freedom until Terry, who had hit seven fours, slog-swept Harry Finch and Matt Machan took the catch on the mid-wicket boundary. It was a setback for Northants, but they lead by 98 and are in a strong position.